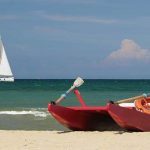 Riccione is a delightful seaside resort offering a harmonious blend of tradition and originality. The seaside development of the town began in 1865 with the inauguration of the railway line, Bologna – Ancona. Development was further stimulated by the American Maria Borman Wheeler (widow of Dr. Giovanni Ceccarini) who built the hospital, the gardens and the port. 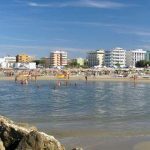 The first summer residences and vacation hotels appeared in the early 1900’s; however, the real “boom” started in 1934 when the, then, dictator of Italy, Benito Mussolini chose Riccione for his family’s summer holidays. From that moment on many bourgeois families built splendid holiday homes close to the seaside. 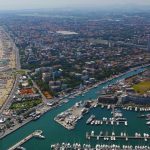 After the second world war Riccione continued to be a very important seaside resort frequented by artists and VIP’s and also nowadays is still the “in” place of high society. The beach in Riccione is spacious, well cared for and well equipped for vacationers. 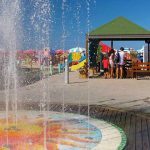 The Marano area in Riccione offers water parks, pools, waterfalls, amusements for children and adults – suitable for families with small and big children – lots of snackbars and restaurants. At night the area is transformed into a night-life of music and dancing on the beach at Zone 134: Paradiso Beach Club, Cafè Operà, Mojito, Barrumba, Hakuna Matata. Delicious dining on the beach with different music themes: nights featuring house, dance, revival 70’s and 80’s, funky, and Italian pop music. In the hills behind Riccione there are the most famous discotechs in Italy: Cocoricò, Peter Pan, Prince, Pascià. The Dolphin Lagoon. The largest in Europe: 12 dolphins present acrobatic and choreographic shows. The Factory (la fattoria) particularly suitable for children since then can meet a variety of small animals like sheep, ducks, pigs, dogs, dormice, predatory birds, etc. Hippocampus presents one of the largest collection of seahorses in the world. If you’re interested in being “pampered”, your ideal destination is the Riccione Thermal Baths. A modern facility located in a small park just opposite the beach. There you will find sulphureous, magnesic and bromo-iodine-salt springs. The “Oasis” Wellness Center offers a series of aesthetic treatments to combat stress and renew a healthy physical condition. And, don’t forget the “Indiana Golf” – la largest mini golf course in Italy.